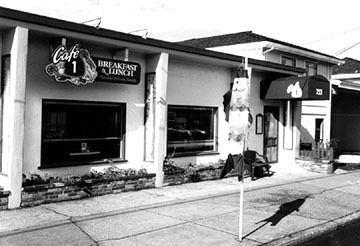 Cafe One is the best organic breakfast and lunch choice with an international array of entrees on the Mendocino Coast. The cafe is owned by the Mex family; Miguel, Andrea and children Cynthia and Angel. Servers help guide guests with allergies or special diets to the right foods. A colorful array of fresh local California grown organic fruits, vegetables, herbs, meats and wild caught fish is served. The organic salsa and Mexican entrees are delicious. The spacious diner atmosphere often overflows with regulars as well as health conscious tourists who know they can change the world by how they spend their money. The menu items are "chemical-free" and non genetically modified. Award winning organic juices (fresh squeezed orange juice on weekends), fair trade and organic Thanksgiving coffee which makes excellent mochas and espresso and herb teas compliment your healthful meal. The early morning smell of oven fresh scones, and just baked vegan pies and cakes bring back fond memories. Cafe One is open Mon-Sat from 7:30am-2:30pm, Thur - Sat till 8:30pm and Sun Brunch 8am - 2pm. Sit down or to go.